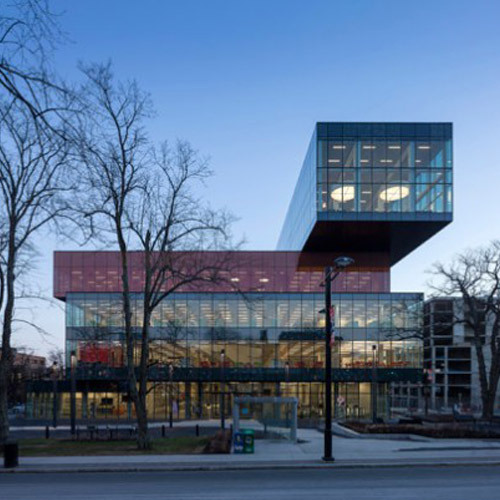 Danish firm Schmidt Hammer Lassen Architects collaborated with local office Fowler Bauld & Mitchell, on the design for the Halifax Central Library in Canada, after winning a 2010 international competition for the redevelopment of the city centre site. 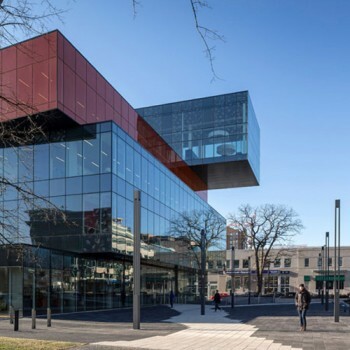 Located at a crossroads in one of Halifax’s most historic neighbourhoods, the building’s four rectilinear volumes have been orientated to follow the angles of the adjacent streets. 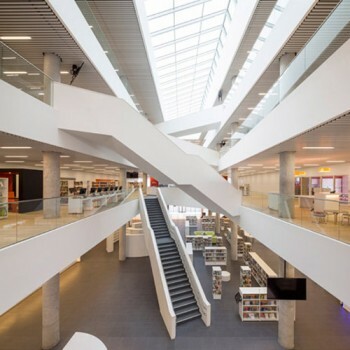 The library is designed as a cultural hub. 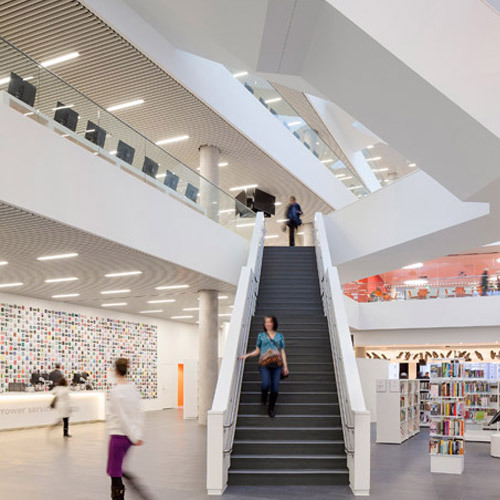 It also includes a 300-seat auditorium, two cafes, music studios, gaming stations, a space for adult literacy classes, a reading circle and boardrooms for local entrepreneurs. 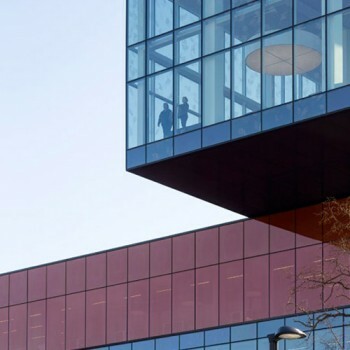 Each of the rectangular blocks features large areas of glazing, designed to offer plenty of visual connections between the interior and the surrounding streets. A fritted pattern of leaves applied to portions of the glazing alludes to the trees that sit at the front of the plot. 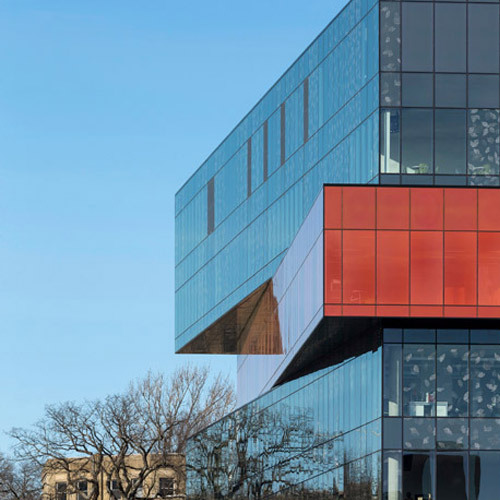 The curtain wall of the third volume in the stack features an orange frit that is intended to complement the tone of nearby brick buildings. 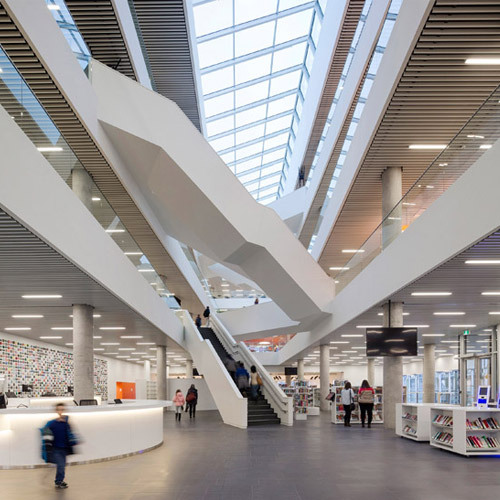 A large atrium at the library’s entrance is criss-crossed by bridges and staircases, referencing the jumbled shapes of the exterior. As well as a reception desk, this atrium contains a reading area with bookcases displaying a selection of bestsellers. A terrace connects the space with an auditorium at the opposite end of the building. 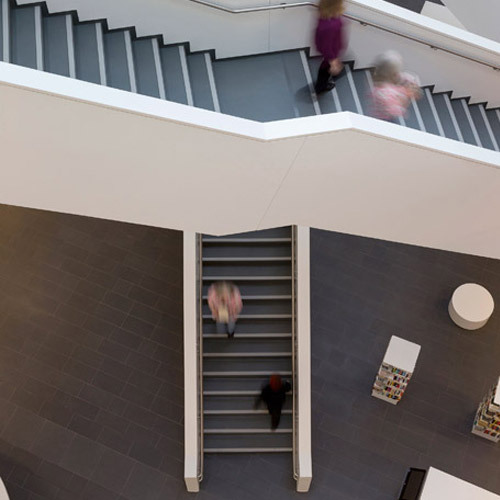 The first floor is dedicated to children and young adults. It accommodates a variety of open-plan reading spaces, with educational facilities including music studios and study rooms arranged around the periphery. 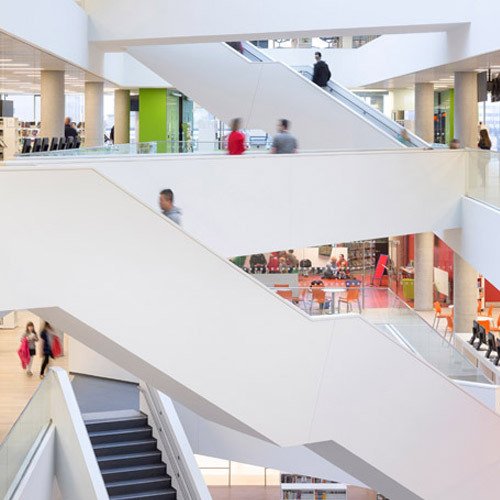 The library’s main collection is located on the second and third floors, alongside adult learning and additional reading rooms. A quiet reading room featuring large suspended circular lights is situated in the cantilevered section of the top floor. 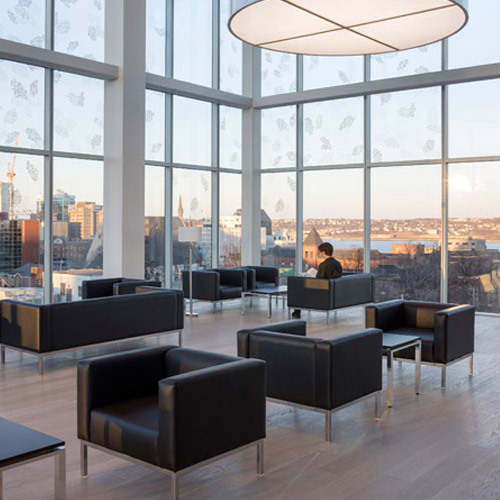 Here, full-height glazing provides views across the city towards the nearby harbour. 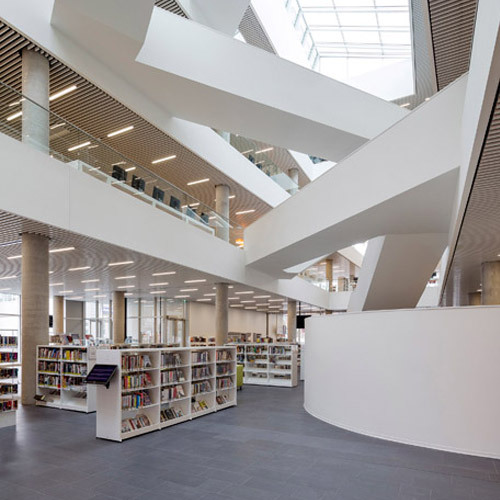 The top storey accommodates a cafe with a balcony terrace and a large skylight allows natural light to filter down through the building’s various levels. 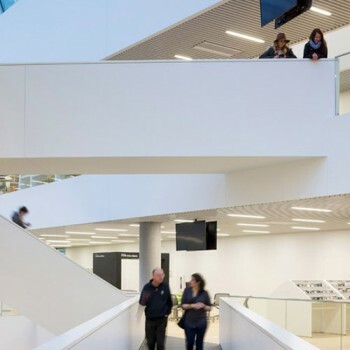 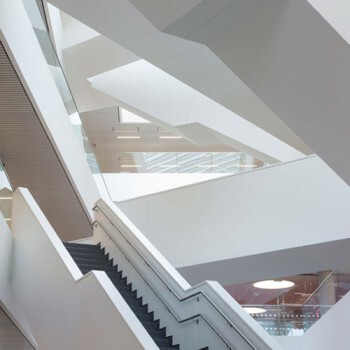 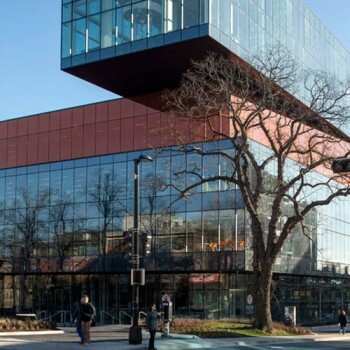 “Halifax is a city whose maritime heritage calls for attention when designing a new public building,” said Morten Schmidt of Schmidt Hammer Lassen Architects, who also recently completed a library in the Canadian town of Edmonton. “The historical axis between the Halifax Citadel and the Halifax Harbour, crossing right through the library site, is reflected in the orientation of the top floor of the building containing the Halifax Living Room, hereby providing not only a unique view but also an understanding of the city’s historical heritage,” he said.